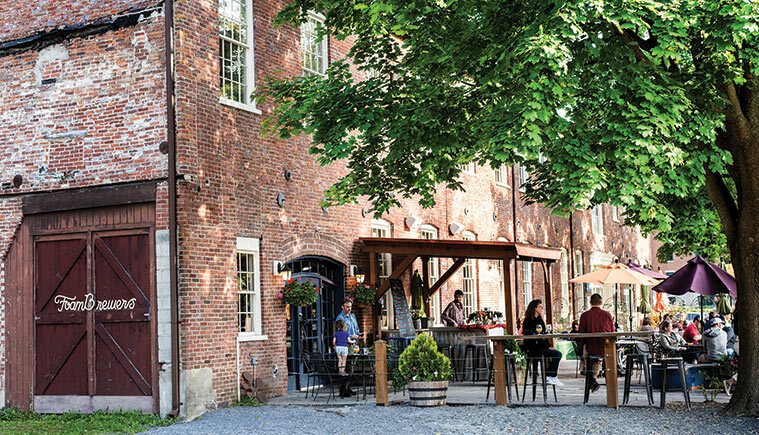 Vast as Lake Champlain, tiny as a fleck of Montreal spice on a Myer’s Bagel, the charms of Burlington, Vermont, are many and varied. Our hometown grabs a quick hold of your heart and does not let go. 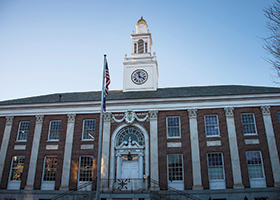 All who have called Burlington home, from new students to alumni returning for Green and Gold Reunions to fourth-generation townies, have their own favorite parts of this place.In this issue, we consider the standards and a few you may have missed. It seems like yesterday that, as a South End Arts & Business Association board member, I was noodling the idea of starting an arts event in Burlington’s South End. We knew it made sense to mix the arts with business, so opening every studio to the public and turning every business into a gallery seemed smart. Twenty-six years later, the South End Art Hop is one of Vermont’s top ten summer attractions, drawing more than 30,000 people from near and far. What started as a one-night affair has morphed into a full weekend of venues and events including a fashion show, road race, parties, craft show, food trucks, and, of course, six hundred artists showing at more than one hundred locations. In the early years, it required a lot of work to draw a crowd. My time was occupied putting banners on buildings and posting signs all along the corridor. The Subaru dealer, lumber yard, electric department, cheese outlet, furniture shop, all offered to show art, and the public needed to know. I liked telling the story. Today the event has a life of its own. Artists and businesses start preparing months in advance, pop-ups add to the excitement while tried and true stalwarts anchor the event. Sustaining sponsors recognize the value of supporting the fun, and the local publications help with promotion. The economic boost provided by Art Hop is palpable. Art sales are brisk, and business relationships are kindled. The owners of Great Harvest Bakery chose to locate their business here after experiencing the event. Restaurants stock up for the busy weekend, and food trucks roll in to take advantage of the mile-long block party vibe. I love art, and I love business. 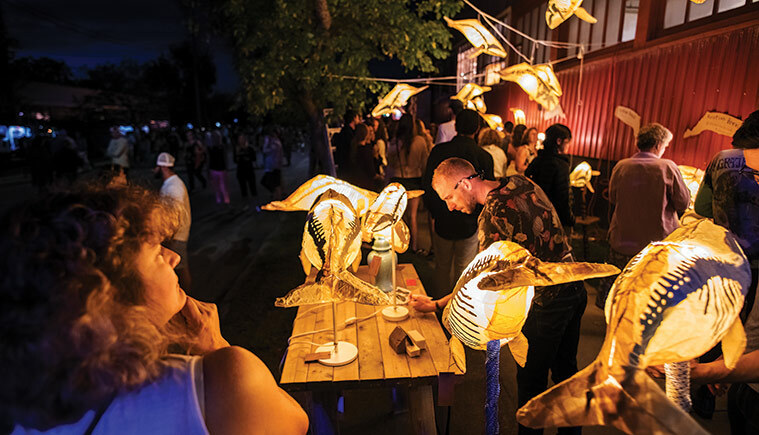 We’ve been on Pine Street for thirty-eight years at Conant Metal & Light, Inc., and for twenty-six of them Art Hop has been an annual celebration of all the ways those worlds come together in this corner of our city. —Penrose Jackson ’70, first director of the Church Street Marketplace. Current director of Community Health Improvement at the UVM Medical Center, Jackson also serves as president of the UVM Alumni Association Board Executive Committee. My family eventually moved away from Burlington. But, years later, I returned to attend UVM as an undergraduate. Where I had once watched in wonder—like a scientist observing creatures in the wild—roving groups of students wander from building to building looking for the party, I was now lost with and among them. As a kid, I didn’t know that the activity wasn’t the party itself, but trying to find it. Nor did I know that the sights and sounds of my childhood—people enthusiastically talking over each other, outbursts of shared laughter, the thump and crackle of music played through already-blown speakers—would be the same sights and sounds punctuating my college experience and, eventually, my own children’s earliest memories. My fellow UVM-alum husband, Jeff, and I are raising our family in downtown Burlington in a house just a few blocks away from my college apartment, next to a market that specializes in craft beer and breakfast sandwiches. Our kids will never know the enchanted life of the faculty brat, but they know about living among students. They know that the sound of people enthusiastically speaking over one another is why we sleep with sound machines. They know that if the thump and crackle of music played through already-blown speakers is still thumping and crackling at two in the morning, mom might take a little walk down the street to offer a couple of neighborly choices... in her pajamas. 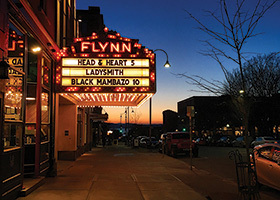 What I knew as a kid growing up in Living and Learning and as a UVM student, is what my kids know now—that there’s just something a little bit magic about this dynamic, imperfect, sometimes too loud, never-enough-parking college town. What our kids know is that we stayed here—downtown, in this neighborhood, in the heart of this small city—not in spite of the random midnight fireworks, or the wild circadian rhythm of students leaving and returning over an academic year, but because as long as we know there’s a group of students out there enjoying life looking for a party they’ll probably never find, we can still see possibilities and bet on hope. These two students were here in Essex last spring as part of their work in Community Development and Applied Economics 295, Local Community Initiatives. Their semester-long assignment: serve as consultants to Weber and other volunteers who have formed a group that aims to build a park like this one within Burlington. What the students learned is the community value of some carefully placed piles of dirt. “Our data shows a lot of interest,” said Janggen. 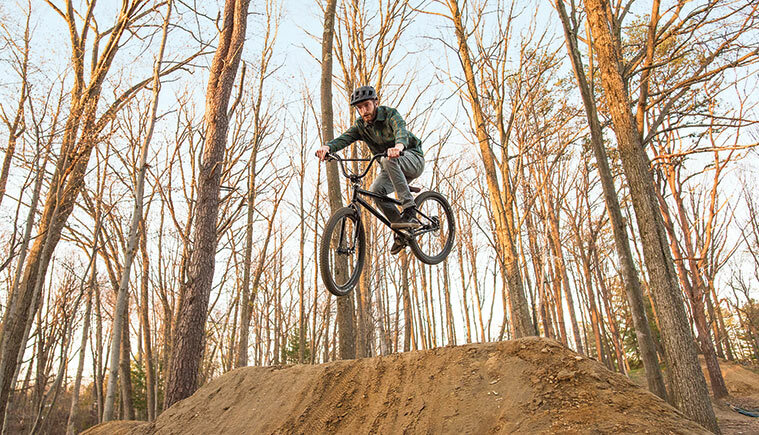 She and Lantieri and two other classmates designed a survey that reached 890 people and “almost every one of them was positive about having a bike park in Burlington,” she said. “What’s the best thing about Burlington? It’s close to Vermont.” Ha, ha. Yes, that old local joke stings a little. But, embracing it, we went down to SkiRack, retail temple for fun hogs of many stripes since 1969, to ask co-owner Spike Clayton ’80 about his favorite places to recreate beyond the city limits. A varsity alpine skier as an undergrad, Clayton raced as a semi-pro cyclist for several years post-graduation and competed in the 1984 U.S. Olympic Trials. 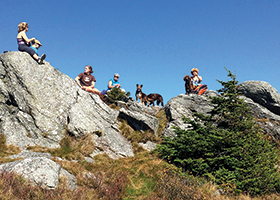 “The trail systems, the roads, hiking, whatever it is, across the board, we are totally spoiled here,” he says. open, alpine feel on the summit. Road Bike: Kingsland Bay in Ferrisburgh to the Crown Point Bridge, many low-traffic roads. Nordic Skiing: Trapps, Craftsbury, or some ten-kilometers of homemade trails right out his back door in Hinesburg, which, you know, is in Vermont. 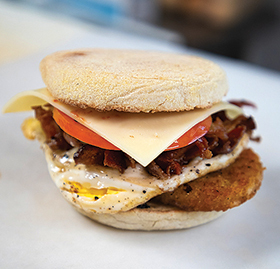 You can’t throw a stone in Burlington without hitting a breakfast sandwich. You also can’t throw a stone without hitting an opinion about which is best. Everyone has their own favorites and, as I discovered when polling my restaurant co-workers about the matter, people are fiercely loyal to their regular spots. In nearly a decade of eating in Burlington, first as a college student and more recently as a chef, I’m no exception to this rule. These are three of my favorite egg sandwiches in town. Parkway Diner As egg sandwiches go, this one, served on an English muffin with American and choice of meat, is pretty straightforward. What sets it apart is that it’s served with a side of genuine American nostalgia. The Parkway, within easy walking distance of the airport, is one of the few classic diners left in the Burlington area; think red vinyl seating, buffed metallic wall paneling, and unapologetic old-school service. Penny Cluse Cafe The classic Burly brunch joint, Penny Cluse has been around for two decades serving hearty dishes with a South-of-the-Border flair. Their egg sandwich comes on buttery griddled sourdough with cheddar...but add avocado (and a side of watermelon)! It’s still an incredibly popular spot after twenty years in business. If you’re short on time, avoid the long wait and hop one building over to their sister spot, the appropriately named Lucky Next Door, where the same sandwich is also served and can be taken to go. Henry Street Deli I’ve probably eaten hundreds of their sandwiches over the past ten years. The eggs, the bacon, the Taylor ham, the sausage patties; all are cooked in the same enormous skillet (vegetarians, beware!). This adds flavor—and a not insignificant amount of grease—to each sandwich. Order one with tomato and garlic mayo, just don’t expect to get in and out quickly on weekend mornings during ski season, when the entire neighborhood seems to be waiting for a sandwich. Let Knowledge Serve the City. I was struck by this motto on a recent visit to Portland State University because it encapsulates one of my aspirations as a UVM faculty member: to be of genuine service to the city that is one of our university’s greatest assets. 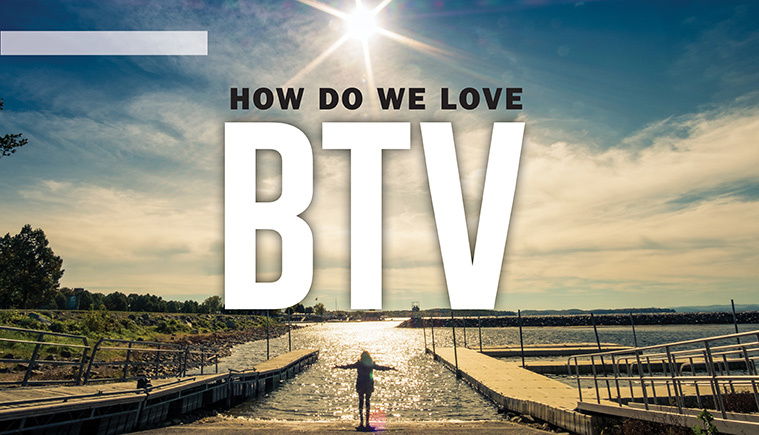 I would add a second phrase to a UVM version of the motto to capture more fully the spirit of reciprocity that is a hallmark of our relationship with Burlington: Let Knowledge Serve the City—And the City Serve As Classroom. Burlington provides an outstanding learning environment and source of mentoring for students and faculty from departments across the university—whether it be history, engineering, education, health sciences, or forestry. As an ecologist in the Rubenstein School, I regularly send my students out to explore local landscapes like the floodplain farms of the Intervale, the renowned thrust fault at Rock Point, the historic Redstone Quarry, and the remnants of a legendary ravine that once cut diagonally though the downtown. One of my favorite outdoor classrooms is the Burlington Waterfront. With its two-hundred-year transformation from sandy bluff, to lumber port, to railroad yard, to industrial center, to bulk petroleum storage facility, and now to recreational destination, it’s an amazing laboratory for investigating our relationship with land and lake over time, and for envisioning a sustainable future for the city. Stories of these remarkable places were recently woven together into a community outreach program called Burlington Geographic. 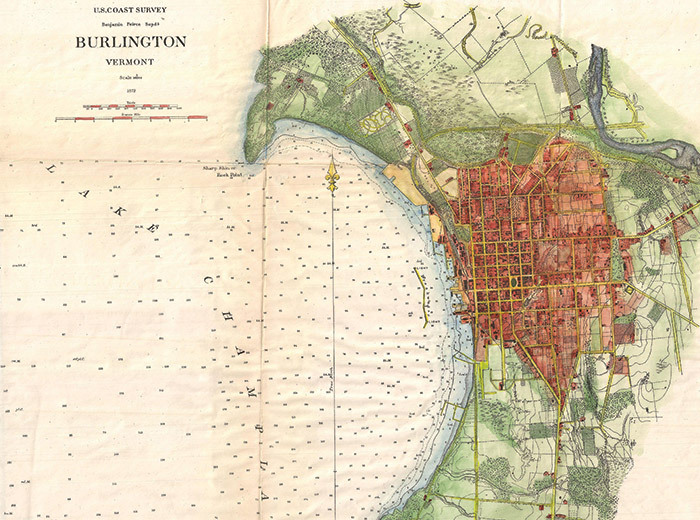 By giving voice to diverse narratives, showcasing partnerships and sustainability initiatives, connecting educators with local experts, and infusing energy and ideas, Burlington Geographic aims to engage the whole community in a celebration of place. For the past three years, faculty, staff, and students have been working closely with the community on creating an integrated series of presentations, field workshops, and web-based resources designed to deeply explore Burlington’s cultural heritage, natural history, and ecological potential. Teage O’Connor’s shoes are the first surprise. They’re orange. That much is fluorescently obvious even in the pre-sunrise gloom of this August morning. He laces them up on his front porch as we talk about the route. “Let’s start with Centennial Woods,” he says. We’re going to try to run a “wild” marathon—26.2 miles within the city limits of Burlington, traveling mostly through some of his favorite patches of woods and unmarked backways. What’s more surprising is that O’Connor is wearing running shoes at all. Just yesterday, he ran a hilly five-mile race on pavement in bare feet. He finished fourth, averaging 5:16 per mile. In 2017, he set the world record for the fastest barefoot one-hundred-kilometer run, covering sixty-two unshod miles in seven hours and thirteen minutes. We loop through his backyard just off Colchester Avenue. “Here’s where a moose came over,” he says, pointing to a bent fence. Running downhill through dark woods, he gestures toward a patch of exotic trees, perhaps left behind by some landscapers. “Ginkgo, yew, Japanese maple, Siberian elm,” he says. The sun begins to catch the treetops as we bump along a trail through UVM’s sixty-five-acre natural area, Centennial Woods. He points out where beavers have chewed on the footbridge. The wildflowers under the powerline spakle with dew. Forty-nine percent of Burlington is open space—parks, cemeteries, soccer fields, farmland—and half of this open space is a patchwork of natural areas: clayplain forests, alder swamps, ancient sand dunes, peat-filled wetlands, dolomite cliffs. I had imagined O’Connor would scrupulously avoid pavement and stay in these places where, you know, all the nature is. But, as we run along this morning, he seems indifferent to the neat binary categories of natural versus human—and more interested in finding what he calls “hidden places,” the experience of crossing the landscape a bit like a fox: looking with practical eyes for how to get around efficiently, searching for the more-than-human wildness that pops up everywhere. “I’ve been obsessed with this idea of connecting to a place and learning everything I can about it,” he says. 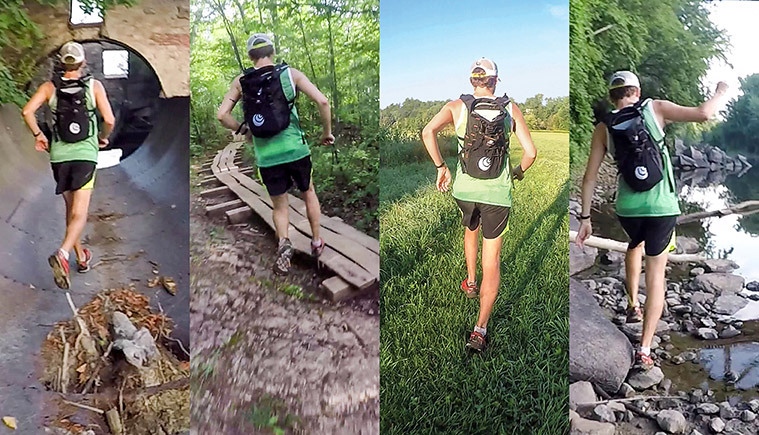 At times, when he’s been training for one-hundred-mile footraces, “I try to become this feral animal,” he says. We cross the parking lot of what used to be a concrete plant and plunge into a trail-less riot of vines and ferns near the Winooski River. “Whoa. A deer,” O’Connor says as the animal jumps up from where it was bedded and crashes away. At the river’s edge, delicate footprints of raccoons cover the mud; bobcat and mink tracks have been spotted nearby, too. Upriver, the bridge for Interstate 89 passes overhead. Downriver, we can see the red brick of Winooski. We’ve been out for almost half an hour and “we’ve gone one mile,” O”Connor says. Twenty-five to go. O’Connor jumps off a stack of concrete blocks, climbs over some driftwood, and into a rusting eight-foot-high pipe along the foundation of Chace Mill. Soon we’re running along an iron trail, the chopped remains of a riveted half-pipe perched between the historic building and the river. Steampunk meets nature hike. We follow the river. Over the road, down the embankment to Salmon Hole Park, and a dash over rocks that hold ripples from a five-hundred-million-year-old tropical sea. For several miles, we follow the Riverwalk Trail and then go off-trail under the railroad bridge, and into the Intervale. In these seven hundred acres of bottomland, silver maples, and farm fields, the running begins in earnest, flowing along the sandy river-edge. I’m already getting tired and sweaty. My trail guide is not. O’Connor follows his memory through a few neighborhoods and then plunges across a backyard into the sixty acres of Ethan Allen Park, cool in a shade of oaks. “Barred owl,” he says, pointing. He’s seen this owl four or five times, he thinks, but there are many owls in this park, “because there’s a higher density of squirrels here than anywhere I’ve ever been,” he says. Near the ten-mile mark we go into and up the stairs of Ethan Allen Tower, highest point in the city. Sidewalks give way to baseball fields to the brushy backyard of the Smith School to the Mount Calvary Red Maple Wetland, twelve bizarre acres surrounded by post-war houses. Here wet meets dry. We pass drought-tolerant pitch pine and black oak growing on the sandy remains of an old river delta, and then jump onto boardwalks over mucky pools of water. At thirteen miles, we run onto Derway Island, actually a 148-acre peninsula near the mouth of the Winooski River—floodplain trees, buttonbush swamps, the rusted ruin of a car, and ferociously itchy nettles. We’ve reached the northernmost extent of Burlington and the halfway point of our run. The miles and landscapes begin to blur together as my aging legs try to keep pace with O’Connor’s effortless gait. He dances over a driftwood berm and along the spectacularly wild edge of Lake Champlain, churning over the sand toward Starr Farm Beach. A lap through the sandy woods behind Starr Farm Nursing Center, then O’Connor hunts for some remembered-but-now-developed forest on Appletree Point. At eighteen miles, we stop for chocolate milk. O’Connor finds an unblemished watermelon in a supermarket dumpster and we happily eat it. 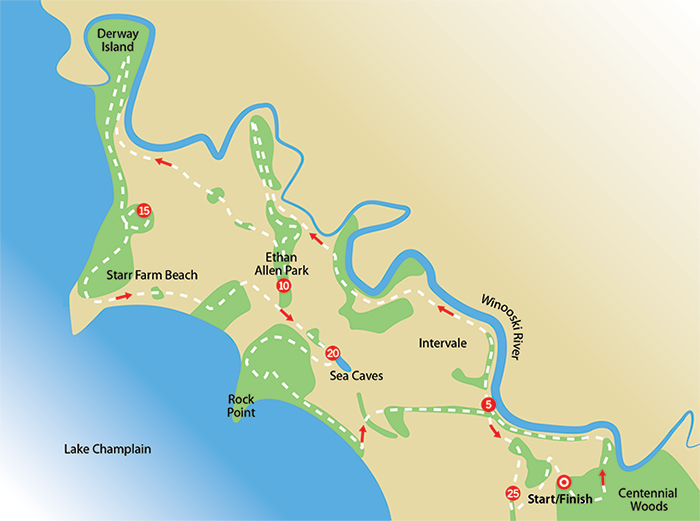 Then we skitter over North Avenue and plunge back into the trees and down a steep embankment to the Donohue Sea Caves. Hanging from roots and rocks, we lower ourselves onto the beautiful algae-covered floor of the cave, created by the wave action of the Champlain Sea not long after the glaciers retreated. “It’s not pristine,” he says pointing to a tire and rusting drum at the cave entrance, but in higher water “big fish swim in here,” he says, drawing eagles and osprey. I start a second GPS watch with fresh batteries, while O’Connor calls his wife to explain why we’ve been gone for four hours—and still have six miles to go. We run into the Arms Forest behind the high school, a meandering set of trails and boardwalks through mature maple woods—and the only place in Burlington where you can find rare yellow lady-slipper orchids. The parcel adjoins Rock Point, perhaps the finest jewel of land in the city, 130 acres with breathtaking cliff views and a famous trick of geology called the Champlain Thrust Fault, where older dolomite rock lies atop younger shale. Here’s where Crow’s Path—the outdoor field school O’Connor founded and leads—teaches children natural history and primitive skills, like fire-making. At twenty-three miles, I’m so tired I feel like I’m in a tunnel. And then we are. O’Connor leads us around a line of tanker cars, onto the rail line and into the train tunnel built under North Avenue in 1861. If coyotes can use this to get across town, apparently so can we. At twenty-five miles, we’ve climbed up through some steep trees off Riverside Avenue and decide to take a pass across the UVM Green. Teage O’Connor bounds joyfully over the grass and jumps directly into the fountain. “Clearly not enough people run through that fountain,” he says. We run past Billings Library, then take a slow lap around Trinity Campus to nudge the Garmin over twenty-six miles. —Joshua Brown, story and Go-Pro photography. Map graphic by Kira Bellis '18. In 2014, after ten years in the making, Burlington became the first city in the country to source 100 percent of its electricity from renewables—hydro, wind, biomass, and solar. While that pioneering achievement drew national and international attention to our city, Burlingtonians knew it as the latest example of a longstanding city and state mindset to think differently—to make “Think Globally, Act Locally,” more than a bumper sticker slogan. Working for the City of Burlington, I’m proud to be part of local government that values smart planning, is committed to long-term solutions over short-term gains, and embraces the principle that all Burlingtonians, regardless of income or ethnicity, deserve the benefits of a sustainable city. 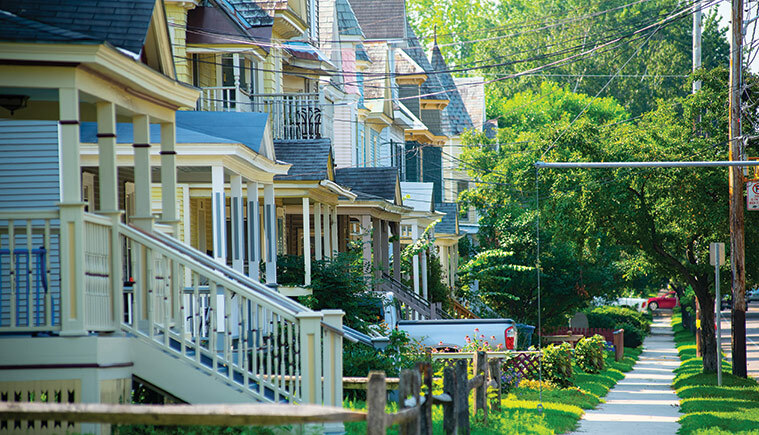 Building on this success, Burlington recently set its next ambitious target—to become a “net zero energy” city in the thermal (heating and cooling) and transportation sectors, which will involve continuing to produce and source more renewables as we begin to transition the city off of fossil fuels. Stay tuned. "When people found out I grew up in Santa Monica, on the beaches of Los Angeles, they’d ask, ‘Why did you move here?’ The moment I got to Burlington, I found this close knit, small city, with a walking promenade, bluffs overlooking the water and this body of water to the west, and of all the places I visited outside of California I felt the most at home. So when I came to visit, not only was everyone incredibly nice and I fell in love with the sense of community, but my sense of place was well-oriented." —Kesha Ram ‘08 has remained a Vermont resident, serving four terms in the state legislature and recently completing her Master of Public Administration at the Harvard Kennedy School. Tucked away on Lake Street, up past Skinny Pancake, you’ll find the inconspicuous home of one of Burlington’s newest breweries. Foam Brewers is young in many ways—founded in 2016 by a team including Sam Keane ’12 and John Farmer ’13, they make experimental beers, serve gourmet cheese on slate boards, and play host to yoga nights. In spite of its age, Foam feels like it’s been here a long time, like it decidedly belongs. When I moved to Burlington five years ago, I was drawn down the hill to the waterfront, like all newcomers to the city. There, the paradox of my surroundings baffled me: drinking in spectacular sunsets at the foot of the derelict, overgrown Moran Plant. There’s a grittiness to this stretch of shore, an echo of history, a rusty tinge of early industries not yet scrubbed away. It’s an intangible feeling I get on this stretch of the lake, and it’s one I get inside Foam. Sure, the beer styles are newfangled—my grandfather wasn’t drinking a sour ale fruited with tangerine or a Double IPA when he drove a Public Works snowplow in the Queen City a century ago. But he might have glanced at the same exposed bricks along this wall or admired a sunset over the Adirondacks from the place where Foam’s patio now sits. And of course, there’s lots about Foam that feels decidedly BTV circa now. Three Chimney Farm, founded by a trio of UVM grads, sell their fruits and vegetables out front in the summertime. The brewery space, designed by longtime Phish collaborator Russ Bennett, has metalwork accents by sculptor Kat Clear ’01. And the curved bar? Deliberately shaped that way, to encourage Burlingtonians to turn toward one another. 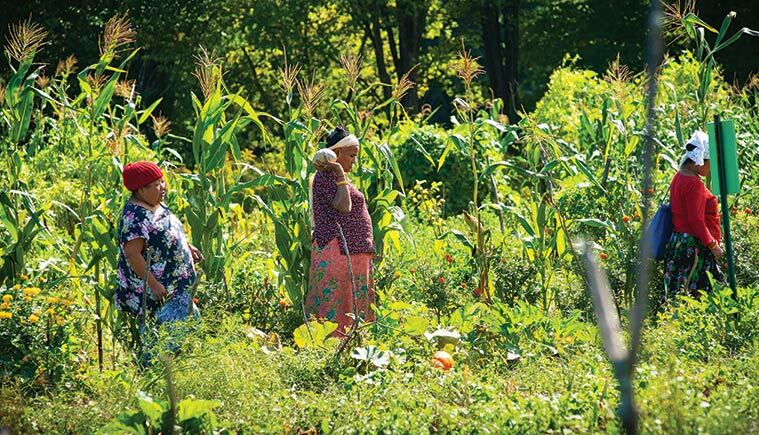 When Bhutanese refugees began arriving in Burlington in the early to mid-2000s, gaining access to agricultural land to grow culturally significant crops for their families was an essential part of resettlement. This has also been the case for other refugee groups resettled in Chittenden County since 1988, a truth behind the creation of New Farms for New Americans, operated by the Association of Africans Living in Vermont, some ten years ago. With more than 250 farmers from Burundi, Bhutan, Burma, Somalia, and Nepal participating in some capacity in the program each year, farmers are producing an estimated 100 tons of vegetables annually on less than five acres. A walk through the program’s farmland along the banks of the Winooski River in Burlington reveals a world of vegetables, flavors, and growing techniques not common in Vermont’s countryside, but increasingly more familiar in Chittenden County. Bitter melon, roselle, and African eggplant highlight flavors of bitter and sour, while snake gourd and caigua fruits hang from vines climbing wildly over homemade trellises. Beyond the farm field, New Farms offers workshops on growing crops in a northern climate and preserving the harvest to help feed families through a Vermont winter. All of these efforts—supported by dwindling federal funding and critical philanthropy—play a key role in addressing food security and tight personal finances, while helping New Americans feel welcome and at home as they begin the next era of their lives in Vermont. Five miles up the Burlington Greenway, just before you cross the bridge over the Winooski River, it’s easy to miss the side path down to Auer’s Family Boathouse. But to pass it by is to pass by a deep and authentic piece of Burlington culture, a place where reality edges into relic. The rewards of stopping, besides a cold Coke on a hot day, are a look into the past at this living time capsule, which first opened for business in the 1920s. An old piano and jukebox conjure memories of when residents of Burlington’s New North End gathered for dances in the 1950s. 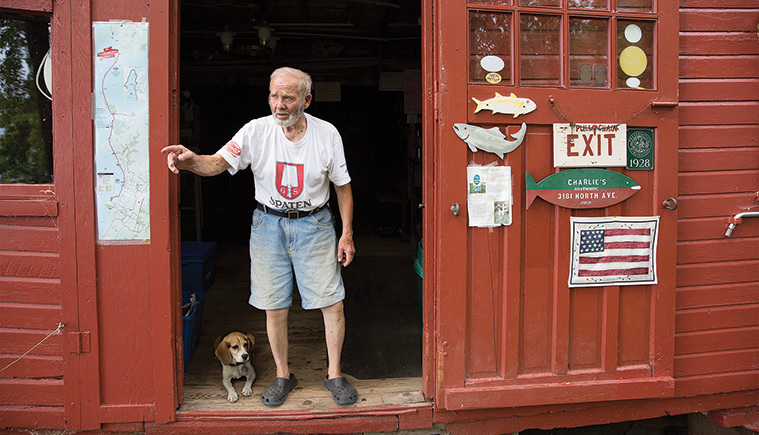 Worn wooden oars, nightcrawlers and minnows in the cooler, nets and tackle, give the place—AKA simply as Charlie’s Boathouse—the look, smell, and feel of everyone’s summer vacation by the lake. If you want a grass-fed burger or microbrew, stay downtown. Out here you won’t get anything fancier than a microwaved hot dog, ice cream bar, candy or chips or a soda. What you will get is lots of talk and laughter from Charlie and his sister, Christine Auer Hebert, and a welcome to sit down, stay as long as you like, and enjoy the view where the river meets the lake. 15. Nectar’s neon, long may it spin. 16. When solid ice turns Burlington Bay into a vast playground. 18. Saturday Farmers’ Market. Name another state where you can buy fresh carrots from your lieutenant governor. 19. Hammocking at Lone Rock Point. 20. Highest number of dogs per capita in the United States? 22. Dining al fresco: Michigan from Beansie’s Bus with Battery Park lake view. 23. Five dollar live music at Light Club Lamp Shop on North Winooski. 24. Donuts on the north wind from Koffee Kup Bakery on Riverside Ave.
25. Roasting coffee beans on the west wind from Speeder’s on Pine Street. 26. North Beach. Bonus points during a sunny Senior Week. 27. Champlain Thrust Fault. Geology gone mad. 28. When Lloyd, master bagelman of Myer’s Bagels, tosses you one straight out of the wood-fired oven. 29. Running up College Street from the lake to the green. That which does not kill us, makes us stronger. 30. A sandwich and a seat on the ski bench outside Henry Street Deli. 31. Braving open mic at the Vermont Comedy Club. erogi from Luiza’s, ice cream from Scout’s Honor, and crispy florets from The Broccoli Bar. 33. Ferry horn’s blast from the King Street Dock. 34. Camino Creemee: College Street to Burlington Bay to a swing on the boardwalk. 35. Crow Bookshop plus Pure Pop plus Old Gold. 36. Secret garden at Red Onion. 37. Searching the labyrinth of City Market. I swear the black beans were here last time. 38. Off-ramp to UVM and BTV.